1) From September 17 to October 14, Legal Sea Foods’ sixth annual Oyster Festival will offer a sequence of in-restaurant menu features and special events to celebrate everything oysters. In-restaurant rotating features will be available for the duration of the Oyster Festival and include the following culinary treats: Oyster Stew (freshly shucked oysters simmered with cream, butter and herbs); Oysters Legal (freshly shucked oysters baked with spinach, cheese and crumbs); Fried Oysters (pickle relish, BBQ mayo, cole slaw); Bacon Wrapped Oysters (spinach salad, black quinoa, pickled red onion, creole mustard vinaigrette); Oysters Jambalaya (crisp fried oysters, jambalaya rice); Bacon Crusted Oyster Lettuce Cups (Bibb lettuce, goat cheese, pickled radish, Green Goddess dressing); and, Oyster Po’ Boy (crisp fried oysters, chipotle mayo, lettuce, tomato, po’ boy roll). And, of course, the Legal Sea Foods teams will shuck seasonal standouts at their raw bars for those who opt to go au natural. Reservations: not required. In case of rain, this event will be held in the atrium of the restaurant. 2) Ireland’s top food and beverage stars pair with Boston’s finest to bring the taste of Ireland to Boston at iFest in the Seaport World Trade Center. Participating chefs include: Barbara Lynch, Ana Sortun, Lydia Shire, Ming Tsai, Jasper White, Colin Lynch, Darina Allen, Kevin Dundon, and Cathal Armstrong. · A Bewley’s Irish Tea Party with Boston’s top pastry chef, Maura Kilpatrick. · Beer tastings at the new, experiential Guinness 20/20 Bar which will show the future of what Guinness pubs will look like, served with samples of Irish food. · Jameson Irish Whiskey tastings and a master cooperage experience with a top master cooper from the Midleton distillery. This master class will include demos on the old skill of cooperage – taking the barrels apart and showing how whiskey is distilled. · Chef demonstrations with Ireland’s best chefs – Darina Allen, Kevin Dundon, Cathal Armstrong – joining forces with America’s finest including iFest Culinary Ambassador Barbara Lynch, Ana Sortun, Lydia Shire, Ming Tsai, Jasper White, and Colin Lynch. · An Irish food village with the opportunity to sample Irish produce, cheese, and bread and meet exhibitors from Burren Smoke House, Kerrygold, National Organic, and Crossogue Preserves. 3) The 6th Annual Flavors of Boston is a unique gourmet delight with the top chefs from Boston who assemble for a night of elaborate table décor, exquisite food, and a great cause. This year, the Flavors of Boston Gala event will be a 1920’s inspired themed event to ensure a carefree and exciting evening. Each chef hosts his or her own personal table for 12 and will prepare a tableside multi-course gourmet extravaganza. This allows all guests to do more than just eat the food; you will have an unforgettable dining experience while helping to fund the research, education and advocacy efforts of the American Liver Foundation. Flavors was first stirred together in 1991 by James Beard Award winning chef Christopher Gross in Phoenix. Chef Gross and other area chefs were interested in supporting the mission of the American Liver Foundation. Today the event is hosted by the organization in 20 cities across the country and raises millions of dollars annually to support the work of the American Liver Foundation. Join us for a night that you won't soon forget while helping to improve the lives of the 30 million people in the United States living with liver disease. BENEFITS: The mission of American Liver Foundation (ALF) is to facilitate, advocate and promote education, support and research for the prevention, treatment and cure of liver disease. Although the endangered nature of numerous fish species often take front and center in the news, they are not the only aquatic creatures which are in peril. Consider the vaquita (Spanish for "little cow"), a rare species of porpoise, which is in dire danger of becoming extinct. Immediate action is necessary to protect this unique, aquatic mammal and I bet most people have never even heard of the vaquita. Vaquita are the smallest of all porpoises, and are also known as Gulf of California porpoise, Desert porpoise and cochito. It wasn't until 1958, when a few of their skulls were found, that their existence was determined, and it wouldn't be until 1985 that live vaquita were actually seen. Their face is distinctive, as they have a black ring around each eye and a stripe from chin to flipper. The vaquita only lives in the northern waters of the Gulf of California, and it is thought that less than 100 currently exist. Let me repeat that: LESS THAN 100! The U.S. lists the vaquita as endangered under the Endangered Species Act of 1973. The Marine Mammal Protection Act, the International Union for the Conservation of Nature and the Convention on International Trade in the Endangered Species of Wild Fauna and Flora also list the vaquita as in danger of extinction. In July 2014, the fifth meeting of the Comite Internacional para la Recuperacio n de la Vaquita (CIRVA) was held, and their report noted the dire situation of the vaquita. The CIRVA report stated that back in 2012, there were about 200 vaquita but that number has been cut in half in only two years! Unless something drastic is done immediately, they could be extinct by 2018, only four years from now. CIRVA's primary recommendation is for Mexico to immediately establish a gillnet exclusion zone which covers the entire range of the vaquita, expanding the size of the current refuge. Part of the problem has been illegal fishing, especially for another endangered species, the totoaba. Totoaba are being illegally caught because their swim bladder is used in traditional Chinese medicine and garners high prices, several thousand dollars per kilogram. As far back as 1997, it was identified that gillnet bycatch was the greatest threat to vaquitas, and much of that bycatch was through the pursuit of the totoaba, though fishing for other species, such as shrimp, is also responsible. So, prohibiting all gill nets is an absolute requirement to protecting the vaquita. Obviously, Mexico has the greatest opportunity to stop gillnet use and stop illegal fishing, and they must act with all haste. In recent years, Mexico has been proactive in helping to protect the vaquitas, but they must do more. Hopefully the new CIRVA report will lead to new action by Mexico. The plight of the vaquita is a cautionary tale that everyone should consider as bycatch is an issue all across the world. A few years ago, I wrote about NOAA's first National Bycatch Report, noting that in the Northeast region, almost 1300 sea mammals had been caught as bycatch. This was the highest amount of any region, and indicative of a problem that needed to be solved. Bycatch does not involve just sea mammals, but also includes various species of fish, and brings its own problem as well, though those issues are outside the scope of this article. Let us hope the vaquita will be saved! The second week of Dine Out Boston has started, and it seems that less restaurants are participating this year. BostInno recently noted that about 172 restaurants are participating, down from 194 last year. During this time, some of the restaurants which are not participating are running their own dining specials, such as AKA Bistro in Lincoln. AKA Bistro has a special Lunch Menu ($20.14 for 3 courses) and Dinner Menu ($34 for 3 courses), and I stopped by the restaurant last Friday to check out their Lunch menu. I'm a huge fan of AKA Bistro and my lunch was as delicious as usual. Their Specials are a very good value and I highly recommend you check it out this week before it's gone. For your First Course, you have three options, such as a Chill Corn Soup or a Shaved Farm Vegetable Salad. I opted for the Octopus & Clam Ceviche, with coconut milk, basil, lime and Thai chili. The octopus and clams were tender and the "sauce" had rich coconut flavors, with acidity from the line and a slightly spicy kick. It may not resemble the usual type of ceviche you find, but it was a delicious alternative. I would order that again if it were on the regular menu. For your Second Course, you have four options, such as Salmon Donburi, Sauteed Shrimp or Moules Frites. The Moules Frites, which are superb, are normally $19 on the lunch menu so with this special deal, you really get two extra courses for $1. An excellent value. I opted for something different, the Pork Rillettes & Scallion Pancake with plum kabayaki and shaved daikon salad. The Scallion pancake was flaky, crisp and flavorful, especially with the sweet sauce atop it. The pork was moist and tender, with a slightly earthy taste, and the pancake made a nice platform for the pork. I probably could have devoured a second pork-covered pancake as well. You have two choices for Dessert, including their Mousse au Chocolat. I've enjoyed the mousse before so I chose the Angel Food Cake with lemon curd and raspberry sorbet. This was a good-sized dessert, and the cake was light and fresh with a rich lemon curd topping. The silky sorbet was in a crisp "cookie" with nuts and it too was a tasty ending. Such a good deal for only $20.14. Service was excellent, as usual, and I'll probably end up there later this week too, maybe to enjoy some Mussels. Their Lunch & Dinner specials end on Friday so make sure to dine this week at AKA Bistro. Last week, it was reported that Chef Mario Batali spent $410,000 to purchase a liquor license for Babbo, his new Boston restaurant. Maybe he should have waited a little bit longer and bought one of the new liquor licenses that will soon be available. He could have saved at least a few hundred thousand dollars. As there is a cap on the number of liquor licenses in Boston, if a restaurant wants to purchase a license, they must find someone willing to sell one, and the prices can easily run $200K-$400K, if not higher. This makes it difficult for some restaurant owners who cannot afford to pay so much for a license. As such, there have been some efforts to fix this situation. Last year, Boston Councilor Ayanna Pressley, after working on the issue for a year or so, filed a home rule petition to life the cap on liquor licenses in Boston. Since at least 2009, Governor Deval Patrick has been advocating for lifting the cap on liquor licenses in Massachusetts and proposed it once again in this year's Economic Development Bill. Both of these proposals though had a problem, a failure to adequately protect or compensate existing liquor license holders. The current system, which has been in place since a time after the repeal of Prohibition, has made liquor licenses valuable assets. Some restaurants use their licenses as collateral with their banks. If this asset suddenly dropped drastically in value, it could cause severe economic problems for a number of restaurants. We should not potentially hurt over 1000 businesses if there is a way to remedy the situation without harming them. That would set a terrible precedent and be indicative of a lack of empathy. Fortunately, there is a solution that should satisfy all parties, and harm none. Back in July 2013, I ranted in Eliminating The Liquor License Cap? and offered my own solution, raising the limit on liquor licenses as set forth in the current paragraph 7 of the existing law, like "main street districts, urban renewal areas, empowerment zones or municipal harbor plan areas." Interestingly, this is essentially the solution that recently passed in the new Economic Development Bill. After much debate and compromise, the new law has authorized the creation of 75 new liquor licenses in Boston. Although Governor Patrick wanted to lift the liquor licenses cap across the state, the new law deals only with Boston. These new licenses will be spread out over the next three years, with 25 available each year, starting September 1. See? Chef Batali didn't really have to wait too long for the new licenses to be available. Each year, 5 of those new licenses will be available to anyone, all across the city. For example, if you wanted to open a new restaurant in the North End, you could potentially apply for one of those 5 licenses. The other 20 licenses each year will be restricted to areas such as Dorchester, Mattapan and Roxbury, as well as "main street districts, urban renewal areas, empowerment zones or municipal harbor plan areas." It is this aspect of the new law which is similar to my original proposal. Those licenses must remain in those areas and cannot be sold outside of those neighborhoods. The next few months will be fascinating to see who purchases these new liquor licenses. Hopefully, the extra 20 licenses will help invigorate those neighborhoods, allowing small business owners to afford liquor licenses for their restaurants, whether existing or new. 1) From family-run restaurants with well-kept secrets to some of Somerville’s newest and hottest eateries, East Somerville’s restaurant corridor has some of the city’s most authentic flavors and hidden gems. On Tuesday, September 16, from 6pm-9:30pm, a ticket to the East Broadway Foodie Crawl will give diners exclusive access to more than a dozen area restaurants representing five continents for tastings of food and a glimpse of the experience at each. This year’s event will also include the newly-completed East Somerville streetscape, allowing for outdoor seating and music while enjoying the crawl. This crawl leads more than 1,000 people to East Somerville deliciousness each year, and includes not only tasty bites but also entertainment along the way. All proceeds benefit East Somerville Main Streets, which is committed to building a safe, sustainable and prosperous multicultural community by developing a vibrant businesses district at the neighborhood’s heart. Tickets for the Foodie Crawl are on sale now. You can buy them for $20 online and $25 at the door if there are still tickets available. For more information or to buy tickets, please visit: www.eastsomervillemainstreets.org. The event has a rain date of September 17th. 2) Joslin Diabetes Center, the world's largest diabetes research and clinical care organization, will celebrate with “ritmos de salud” at the Artists for Humanity EpiCenter on Friday, September 26, from 6pm-10pm, to benefit its Latino Diabetes Initiative. Guests will enjoy an evening filled with upbeat Latin rhythms from Alexander el Cantante as well as a performance by Boston’s own “Salsa y Control” Dance Company; guests will be encouraged to join in on the dance floor. A fabulous array of food will be provided by some of Boston’s most renowned Chefs, led by our culinary chair – Chef Jose Duarte of Taranta. Diabetes is a disease of epidemic proportions across all populations, affecting certain racial/ethnic groups in even greater numbers. National data demonstrates that Latinos have a two-fold increase in the risk of developing type 2 diabetes compared to the Caucasian population. Joslin Diabetes Center’s Latino Diabetes Initiative (LDI) strives to improve the lives of Latinos affected by diabetes, or at risk for the disease, through culturally oriented patient care, education, outreach and research, as well as working to find a cure. I don't have a valid excuse. I should have done it years ago but, for no specific reason, it didn't happen until recently. Friends advised me to do it, and I read very positive comments in the press, but it just didn't motivate me sufficiently. However, after doing it once, I know that I must do it again, and then again. And I am here to urge others to do the same. What did I finally do? I dined at The Blue Ox in Lynn, which describes itself as "an upscale casual neighborhood restaurant" that "offers an approachable American menu." The Blue Ox, which opened in 2009, is owned by Chef Matt O'Neil, a Swampscott native, who graduated from the Culinary Institute of America in Hyde Park, New York. He has previously worked at such restaurants as Prezza and No. 9 Park, and eventually decided to strike out on his own and open his own restaurant. The Blue Ox has received lots of positive press, and I know a number of people who have dined there and raved about their experiences. Most recently, Chef O'Neil and the team at the Blue Ox were the 2014 Champions of Boston Magazine's Battle of the Burger, and had also been the 2013 Champions. When I dined there a couple weeks ago, I realized what I have been missing for the past five years. On a Thursday evening, at almost 7pm, the restaurant was quite busy, and somewhat noisy. The restaurant is divided into two sections, the main room with a dining section and bar, and a second dining room. We sat in the main room, at a table next to the front window, which gave us a bit more privacy than some of the other tables. Though loud, the noise level wasn't oppressive and we were still able to have a normal conversation. It is more just a lot of energy, especially in the bar area. It definitely has a nice, neighborhood feel, a place to stop after work, for a night out with friends, or just for a good dinner. I began with a Barrel-Aged Manhattan, which was aged in oak for about two months, and you can notice the large, square ice cube in the glass which means the drink won't get diluted as quickly as it would with regular ice cubes. The Manhattan was smooth and complex, with an added depth to it which is probably attributable to its aging. I would have been satisfied to sit at the bar and sip these all evening. The Tonight's Today cocktail is made with Ethereal gin, Manzanilla sherry, grapefruit liqueur, lemon oil, rosemary, and a touch of sparkling rose in a Muscat “showered” glass. Though I am not usually a gin guy, this was a tasty cocktail with lots of herbal notes but also hints of brininess from the sherry. Definitely a nice summer drink. The North Country Old Fashioned is created from house infused bacon bourbon, VT maple syrup, and Ox maple bitters. It was nicely balanced, with mild flavors of bacon and maple, neither overwhelming the other, or the drink. The Sibling Rivalry has Bully Boy vodka, Domaine de Canton ginger liqueur, St-Germain, lemon, and rhubarb bitters. It has a clean, smooth flavor with hints of sweetness and a kick of ginger. The Dark n' Stormy is made with house-spiced Old Monk 7 Year rum, Fever Tree ginger beer, and lime. It has a strong ginger flavor, enhanced by intriguing spice notes. The restaurant is open for dinner from Tuesday to Sunday. Their Dinner Menu is relatively small, but with plenty which should interest any customer. I like the fact they have not tried to create a monstrosity of a menu, with dozens upon dozens of choices. You will find Appetizers (8 choices, $6-$16), Soup & Salad (4 choices, $10-$11, with extras), Burgers (3 choices, $13-$16); Pasta (3 choices, $22-$24), Entrees (5 choices, $22-$25), and Sides (6 choices, $6-$7). They also have a Gluten Free menu. On the evening I dined, there were a few different Specials too. Of the Appetizers, I had to check out the Fried Maitland Mountain Farm Pickles ($9), with grilled lemon & thyme aioli and aged balsamic. When fried pickles are done well, they can be delicious, but far too often they end up as limp and soggy. So, it would be a good test of the kitchen to see whether these fried pickles were worthy or not, and they passed with flying colors. Maitland Mountain Farm is an organic, urban farm in Salem, MA, well known for their pickles. The fried pickles had a tasty, clean and crunchy coating over a crisp and flavorful pickle. A nice way to begin our dinner. One of the Special Appetizers was Chicken Wings, which had initially been rubbed with Cajun seasoning and then cold smoked in whiskey barrels. Afterwards, they were battered, fried and tossed in a house made honey hot sauce. Finally, they were covered with a Great Hill Blue Cheese & tarragon dressing, sliced scallion, and black sesame seeds. Fortunately they give you wet naps as these are messy, and you'll be sure to devour them. The smoky spice of these wings was excellent, and it was a crunchy bite to the tender, moist meat inside. The sesame seeds added an extra crunch and the dressing helped to cut the spice. If they are a Special again, be sure to order some. The Spicy Tuna Tartare ($16) is probably their signature Appetizer, and they mix the tuna with cucumber, cilantro, scallion, lemon juice, EVOO and their homemade chili sauce. They then place chive cream atop their house made aged potato chips, and place the tartare atop it. It had a very nice taste to it, well balanced though personally I would have liked a bit more spicy heat to it. The potato chip added a salty crunch and I thought that was a nice addition to this dish. Charles, the Beverage Director, recommended a California Zinfandel with the duck. Though a number of people recommend this same pairing, I have often found Zinfandel to be too big and tannic for duck but I was willing to take Charles' recommendation. The 2009 Canard Vineyard Zinfandel ($75/bottle) was excellent, and worked very well with the duck. It was smooth, with restrained tannins, nice black fruit flavors and spicy accents. It isn't your typical Zinfandel and Charles was dead on in his pairing suggestion. And as the Canard generally retails for $45, the wine has a low markup as well, making it a good value too. As for Entrees, one of the Specials was a Grilled Swordfish, which was topped by a Napa cabbage slaw and served with a crispy Kurobuta pork and Maitland Mountain Farm red onion & parmesan risotto cake. The Swordfish was tender and meaty, enhanced by a cucumber and Champagne vinaigrette sauce. A delicious piece of seafood, and the risottto cake was also tasty, with a nice exterior crunch and a flavorful interior. The Blue Ox Burgers ($16) comes with two ¼ lb. burgers stuffed with gorgonzola dolce and topped with applewood smoked bacon, tomato, lettuce, grilled lemon & thyme aioli. The burgers come with herb French fries though I asked them to substitute their hand cut potato chips. All of their burgers are made from Prime beef and are hand packed each day, which also means there is limited availability. The burgers were juicy, with a strong gorgonzola taste, which also oozed out once you bit into the burger. For blue cheese lovers, this is an impressive burger. The brioche buns are fresh and work well with these burgers, actually helping to add a little sweetness to balance the tang of the cheese. And the potato chips were crisp and addictive. An excellent dish of comfort food. For dessert, the Sticky Toffee Pudding ($10), with toffee caramel sauce, whipped cream, and caramel sea salt ice cream is a good choice. The moist pudding "cake" went well with the sauce and ice cream, and it wasn't too heavy. It was perfect for two of us to share after everything else we had already eaten. Our server, Matthew, did an excellent job and I have spoken to others who have been served by Matthew and also raved about his performance. The food and drinks are excellent, and I like the neighborhood vibe of the restaurant. I know understand why so many people have recommended this place to me, and I will be sure to return soon. I have absolutely no excuse now. I give The Blue Ox my hearty recommendation. I'm fortunate to live in Massachusetts, where local seafood is available, from Island Creek Oysters to Nantucket Bay Scallops, from Lobster to Cod. Right now, a flood of tourists are visiting Massachusetts, checking out places like Rockport, Hyannis and Provincetown. Many of those tourists will enjoy the bounty of the waters of Massachusetts, fresh and local seafood prepared in a myriad of ways, from lobster rolls to fried clams. Everyone has their favorite spot to find such seafood treasures, and it is our good fortune to have so many tasty choices. In the near future, Massachusetts seafood is hopefully going to receive a large boost in publicity, making it well known across the country, as well as helping to boost our local fishing industry. Hopefully it will also lead to more Massachusetts residents eating seafood more frequently. And why is this so? Because the the Massachusetts legislature and Governor Deval Patrick have recently enacted H.R. 4377, Promoting Economic Growth Across the Commonwealth, which has created a new Seafood Marketing Program. Back in 2010, the legislature established a Special Commission on Seafood Marketing to determine whether a marketing program for Massachusetts seafood would have merit. Their report was issued in July 2013 and concluded that it would be worthy to create a marketing program for wild-caught seafood landed in Massachusetts. The conclusions of this report eventually led, in December 2013, to the filing of Bill S.1979 by Senate Minority Leader Bruce Tarr, who also served on the Special Commission, to enact such a program. This bill was so popular it garnered twenty-three bi-partisan, co-sponsors. The value of the Massachusetts seafood industry should not be underestimated. The Commission found that the value of landings in 2011 was $571 Million, second nationally only to Alaska. The industry also employs over 11,000 people, with secondary employment of over 11,000 people as well. Unfortunately, the Massachusetts fishing industry is facing significant problems, especially due to large reductions in catch limits. Something needs to be done to assist the industry, to protect our fishermen and boost the economy. Senator Bruce Tarr stated, “The people that depend on our commercial fisheries are fighting every day for survival against monumental challenges, and our state needs to play an active role in promoting the value and consumption of their harvest.” A noble sentiment, worthy of our efforts. And Representative James Cantwell, a co-sponsor of the Bill, stated, “A properly organized seafood marketing program will both promote the health benefits of eating seafood and brand our Massachusetts harvested products, so Massachusetts Fresh Seafood will be as recognized and sought after as Florida Oranges, Vermont Maple Syrup, Georgia Peaches, and Napa Valley Wine.” The multiple objectives of this program will help in many ways. - Identifying a range of sources and mechanisms to fund program activities and to increase the scope of program outreach to the public and other stakeholders. Now that the bill has passed, the Governor will appoint a team of twelve people to recommend a strategy to market Massachusetts seafood. This team is supposed to consist of a diverse group, including four commercial fishermen, one lobsterman, one scallop fishery representative, one shellfish industry representative, one seafood wholesaler, one retailer, one seafood restaurateur and two people from fishing advocacy groups. It is undetermined when this group will be appointed, and then how long they will be provided to produce their recommendations. Importantly, funding is dependent on how much the legislature will appropriate for this marketing program. That is obviously a vital step, and hopefully, with the bi-partisan popularity of this bill, the legislature will appropriate a sufficient amount of funding to accomplish its goals. We are moving forward in a very positive direction, and don't want a lack of sufficient funding to grind that progress to a halt, or even a crawl. It is hoped that sometime next year, our seafood might started being labeled as "Massachusetts Harvested," and that people across the country will come to understand the value of that label. I hope this Seafood Marketing Program succeeds as it will be beneficial in many ways, and not just to the local seafood industry. It will help educate consumers as well on the benefits of seafood consumption, and we definitely need plenty of more positive press for seafood. That education should spread across the country, and not just remain localized. It should also help the financial well-being of our troubled fishing industry. My only issue with this new marketing program is that it concerns only wild-caught seafood, and ignores Massachusetts aquaculture. Though ignored, Massachusetts aquaculture will still benefit in some ways through the marketing program as it will be promoting the consumption of all seafood, noting its myriad health benefits. The more positive that consumers view seafood, the better for all fisheries, whether wild or farmed. The problem is that farmed seafood will not be allowed to bear the "Massachusetts Harvested" label and benefit from that positive branding. I believe the majority of Massachusetts aquaculture is worthy of such a label. The majority of aquaculture within Massachusetts involves shellfish, from oysters to quahogs. Grown in Massachusetts waters, this shellfish aquaculture reflects the "merroir," a taste of location, of our waters just as much as wild-caught shellfish. Each particular area of the Massachusetts coastal waters has its own individual characteristics, from temperature to salinity, which affects the growth of all seafood, whether wild or farmed. Why shouldn't farmed shellfish be labeled as "Massachusetts Harvested" when those waters are so crucial to their development? I don't see any reason why it shouldn't be so labeled. As an example, when consumers enjoy Massachusetts oysters, they seek out different kinds, from different locations on the coast, but don't care whether those oysters are farmed or wild. They see all oysters as local Massachusetts products, as it should be. Island Creek Oysters may be farmed but they are still commonly seen as a Massachusetts product. It is the location of those oysters, not whether they are wild or farmed, which provides the most important element of their taste. Let us hope that the committee eventually expands their parameters and decides to include at least some forms of aquaculture, especially shellfish. It too is worthy of a Massachusetts Harvested label. It's true that new restaurants get the lion share of publicity from food writers and restaurant reviewers. In fact, there often is a rush to be the first to review a new spot, though prior etiquette meant reviewers often waited three months or so before reviewing a new restaurant. However, what about those restaurants which have been around at least for a couple years? Don't they deserve publicity too? Shouldn't reviewers update their old reviews to ensure those reviews are still valid? Restaurants that have been around should not be ignored by reviewers (or customers for that matter). Plenty of consumers still want to know whether they are worthy spots or not. And a four year old review may no longer be valid. Restaurants can change, sometimes drastically, from year to year. In addition, reviewing older spots may help differentiate a reviewer from everyone else who is only reviewing new places. This issue has come to my mind lately due to a few different matters. First, I give kudos to the Boston Globe for their recent review that revisited two restaurants, Bergamot and Ten Tables, providing an updated status of both spots. It seems this will become a regular aspect of their restaurant reviewing, occasionally revisiting older spots, and that is a great idea. Second, during my recent trip to Las Vegas, I dined at two restaurants which I had previously visited five years ago. I've re-reviewed both spots, and was pleased to learn that the quality at both restaurants had not diminished. In fact, one of the spots, Abriya Raku, actually seemed to be even better. Five years could have brought so many different changes, whether negative or positive, so I thought it was warranted to revisit those spots and see what time had wrought. Third, later this week, I'll be reviewing the Blue Ox in Lynn, a restaurant that opened five years ago. Even though it is located only a couple towns over from me, I'd never been there before until recently. It isn't a new restaurant so likely won't come onto the radar of many reviewers, but it is a place worthy of review. It received lots of positive press when it opened, but most of the reviews are a few years old. Maybe it is time those reviews were updated. I enjoy checking out new restaurants, but I appreciate visiting established spots. So, restaurant reviewers and food writers, do you review older restaurants too, or revisit a place you previously reviewed? If not, why not? Readers, do you want to read updated reviews of older, established restaurants? If not, why not? The wines of Alsace, mainly white and produced from grapes such as Gewurtztraminer, Muscat, Pinot Blanc, Pinot Auxerrois, Pinot Gris, Riesling, Sylvaner and more. As I've said repeatedly before, Alsatian wines are generally not on the radar of the average consumer but they should be. They can often provide excellent value and taste. They are enjoyable while young but can also age well. They can provide a sense of history, as well as showcase state of the art wine making. At their most basic though, they are delicious. You can read some background info on Alsatian wines here, and also check out my prior Alsatian wine reviews. From those articles, you will quickly see that I am a fan of Alsatian wines. How about you? Recently, I attended a media dinner at Puritan & Co., showcasing eight wines from Alsace. This was my first visit to Puritan, and definitely won't be my last. I enjoyed the food and found the wines to be compelling. In addition, there was plenty of fun and interesting conversation, providing some additional insight into Alsace. Dinner began with a couple shared appetizers, including Clothbound Cheddar Gougeres, which were filled with gooey, melted cheese. The Scallop Tartare, sitting in lettuce cups, were fresh and clean, with bright citrus flavors. Alsatian white wines and seafood often make an excellent pairing. Our vinous sampling began with Cremant d'Alsace, sparkling wine to set the mood while also pairing well with our food. The 2011 Albert Mann Cremant d'Alsace Brut ($22), made by a Biodynamic producer, is a blend of Pinot Blanc, Auxerrois, Pinot Noir and Pinot Gris. With a beautiful golden color, it had flavors of green apple and lemon with brioche highlights. It was elegant and clean, with a pleasing finish. My preference though was the NV Willm Cremant d'Alsace Blanc de Noirs Brut ($16) which is made of 100% Pinot Noir. This Cremant was creamy and smooth, with bright fruit flavors of apple and citrus. It too was elegant and clean, though lacking the toastiness of the Albert Mann. Your preference will depend on the style of sparkling wine you like best. "Pinot Blanc and egg dishes go very well together. It also goes well with herbs." For our first course, I chose the Wild Mushrooms & Farm Egg, which is made with arugula, garlic and smoked brioche. This was an umami-rich dish, the type of dish that makes you want to lick the plate clean, or use bread to sop up all the sauce and egg yolk. I also have to give special kudos to the Rolls at Puritan, which are topped by a bit of salt and have such a great, buttery texture. They are addictive and it would have been simple to devour a half-dozen or more. It is also the type of roll that is ideal for sopping up your dish, so it was ideal for the mushrooms & egg plate. The 2012 Willy Gisselbrecht Pinot Blanc ($12) is an excellent value wine, which was slow fermented in temperature controlled stainless steel tanks. It was fresh and fruity, with delicious apple and melon flavors, and enough character to elevate it above overly simple wines. An easy drinking wine, this would be great on its own or paired with light dishes, from eggs (like this dish) to seafood. The 2012 Mader Riesling ($17) is a Biodynamic wine made from 100% Riesling. It is dry and lean, with pleasant fruit flavors and a mineral backbone. It is the type of Riesling that I most enjoy, and it too goes well on its own, or with light food dishes. "Pork is the national vegetable of Alsace." Though I had a choice of a Pork Chop, I opted instead for the Pan-Seared Striped Bass, with a radish tomatillo and panisse. It was an excellent choice, and I had no regrets. The bass had a perfect sear, adding a bit of crunch to the sweet, flaky white fish below. It is fish cooked this well which would turn almost any person into a seafood lover. The dish is on their regular menu and I heartily recommend it. The panisse, kind of fried chickpea croutons, were also tasty and intriguing. The 2011 Sipp Mack Pinot Gris ($20) is from another Biodynamic producer, and this wine was aged on the lees for 4 months. It was a compelling with, with crisp acidity, delicious melon and pear flavors and a subtle earthiness. Complex, with a lengthy finish, I was very much impressed with this wine and it is again an excellent value. The 2007 Becker Riesling Grand Cru Froehn ($25) is from an organic winery which is not certified Biodynamic yet. It has prominent lemon and lime flavors, accented by a mild petrol taste and a hint of sweetness. After our entree, we enjoyed a cheese course, including Cabot Clothbound Cheddar, Sevre Et Belle Bucherondin and Herve Mona Pyrenees Brebis. "The more it stinks, the better it goes with Gewurztraminer." 2001 Trimbach Riesling Cuvee Friedrich Emile Vendanges Tardives ($75), a wine that hasn't been produced again since this vintage. Mildly sweet, with plenty of acidity to balance it, there were pleasant flavors of green apple, citrus and honey. Consumers, pay attention! Alsatian wines are some of the best wines you probably know little about so seek them out at your local wine stores and restaurants. They won't stress your wallet so give them a chance. 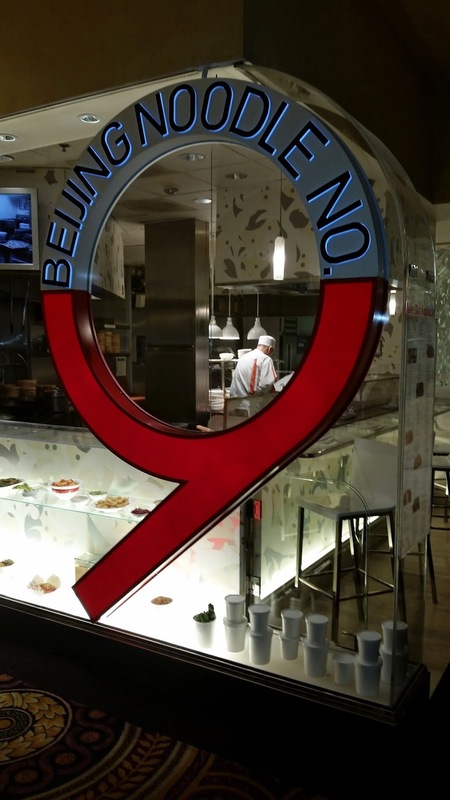 While recently in Vegas, my friends and I ate lunch at Beijing Noodle No.9, in Caesar's Palace, a place I positively reviewed five years ago. My experience this time was equally as positive, and I got to try several more dishes than I had previously. My only criticism is that their prices are higher than many you will find at many other Chinese restaurants, though you have to consider that this restaurant is located inside a major Vegas casino/hotel so you expect to pay a bit more. With the quality of the cuisine, you may not mind paying extra while you are on vacation. As I've mentioned before, as you walk into dining room, you'll pass huge fish tanks containing Ryukin goldfish. I thought the sign on the tanks was amusing. I guess they won't serve any Goldfish Dumplings. The food menu is extensive, and it might take you time to decide what to order. You could dine here several times and never have to order the same thing twice. Dumplings, congee, hot pot, soup noodle, live seafood and so much more. We ordered a bunch of dishes to share, so we all could taste many different dishes, and that is probably your best option if you want to experience the diversity of their menu. We started with the Beef With Hand Pull Noodle ($19.99), which was an excellent way to start. The noodles were more like thin soba noodles, and they had a great texture and flavor. There is a noticeable difference between these noodles, including a certain freshness, than the average ones you find at many other Asian spots. The beef was also tender and tasty. You can even watch them making the noodles at various times in the front window. You should try one of their hand pull noodle dishes. The BBQ Roast Duck ($16.99) was an ample portion of moist and flavorful duck with a sweetness from its sauce. They have two different types of Soup Dumplings, the Beijing Noodle No.9 (6 for $12.99) and the Shanghai (6 for $12.99). Though both were good, I preferred the Shanghai which contained a little less meat and more soup. The soup was an umami burst of goodness, surrounded by the thin, light dumpling skins. These dumplings were so popular, we ordered a few extra dishes. The Lamb Pancakes ($12.99) were like mini-sandwiches, filled with tasty ground lamb, which was spiced well, within a crispy, thin bread. The Kung Pao Chicken ($16.99) was maybe the best example of this dish that I've ever tasted/ It was fresh, with a slightly spicy and compelling sauce and plenty of tender chicken. I probably could have devoured this entire dish myself. This is a vegetable dish, which I think might be the Pea Leaves with Golden Garlic. I didn't taste it but as the plate was nearly empty by the end of the meal, it was enjoyed by my friends. The BBQ Pork ($16.99) was moist and tender, complemented by the slightly sweet BBQ sauce. I liked the crispy coating and the pork was meaty, with only minimal fat. At the end of the meal, we were given a plate of large, almond cookies. We ate plenty for lunch, and every dish pleased us. The flavors are well balanced, and the quality of the ingredients seems high. Service was very good and everyone in my group enjoyed themselves. I recommend this restaurant, though I wish the prices were a bit lower. 1) Travessia, an "urban" winery in New Bedford, has recently announced a partnership with fine wine wholesaler M.S. Walker Inc. They are now distributing Travessia's latest wine releases, including Travessia's Riesling, Vidal Blanc and Pinot Noir Rose, all from the 2013 vintage. "Earlier this year, M.S. Walker came into the winery and tasted all of our wines, and you could sense the excitement. Some of the wines were still unfinished, aging in barrels and tanks. I was impressed by their approach. They were very interested in finding a local winery they could get behind, and they wanted a high quality wine", says Marco Montez, owner and winemaker of Travessia, who is excited about the partnership and looking forward to seeing his wines reach a wider audience. Travessia released its first wines in 2008 and currently makes just over 1,000 cases of wine per year. Grapes are mostly sourced from local vineyards and then brought to the winery in downtown New Bedford where Marco Montez handles all winemaking activities from fermentation to bottling. "We have been researching the greater Northeast from Long Island to the Great Lakes, and Travessia's wines are a refreshing discovery," says Chip Coen, Vice-President of On Premise at M.S. Walker Inc. "M.S. Walker is thrilled to be involved with Travessia Winery!" I am a fan of Travessia's wines, especially as most of their wines use Massachusetts grapes and their prices are reasonable. Marco is doing an excellent job in New Bedford and it is worth making a visit to his winery too. With a local distributor, it should soon be much easier to find his wines all across the state. So keep an eye out for them on your local wine store's shelves. 2) Join the Massachusetts Cheese Guild at Verrill Farm, in Concord, for al fresco evening of cheese tasting with Massachusetts cheesemakers. Get the chance to talk to your local cheesemakers, sample their delicious cheeses and learn about what makes their cheeses unique - the types of cows and goats and what they eat, the cheesemaking and aging processes, the terroir and much more. This is a free Member Only event but everyone is welcome to join the Massachusetts Cheese Guild and it's just $25 for Enthusiast Members. If you're not already a Member, you can join when you sign up for this event. 3) Thirst Boston, a local drinks conference, returns on November 7th-10th. Hosted by industry professionals and founders Brandy Rand, Andrew Deitz, and Maureen Hautaniemi, Thirst Boston will serve up three major parties, 24 seminars, and tastings over the course of four days where guests can join some of the biggest names in mixology from across the country, experience a variety of educational and fun forums, and celebrate cocktails during one all-out weekend extravaganza. I attended last year's Thirst Boston and you can check out my previous impressions, as well as my thoughts on some seminars such as Terroir & Merroir, Fortified Wines, and Whiskey. I also selected Thirst Boston as my Favorite Spirit & Cocktail Event of 2013. In addition, some of the drinks I sampled at the event also ended up on my 2013 Favorites lists. The Thing: Kick off Thirst Boston at the now-legendary 3rd annual “The Thing” gala. Held opening night, Friday, November 7th, at The Fairmont Copley Plaza, this black tie optional party will celebrate all things grande old Boston and feature incredible craft cocktails from some of the city's best bartenders. Portland-Providence Pop-Up: On Saturday, November 8th, bartenders from eight leading cocktail bars will be shaking up their best concoctions, showcasing what they’ve got up their sleeves back in their home cities of Providence, RI and Portland, ME. Held at The Fairmont Copley Plaza, guests will have the opportunity to meet and interact with great talent from nearby cities. Roadhouse: This year, Thirst Boston introduces a brand new shindig for Saturday, November 8th. A raucous throwdown of Southern-style cocktails and cut-offs, BBQ and rockabilly, and more. New England Craft Showcase: On Sunday, November 9th, join the region’s top distillers and brewers for a three-hour tasting event at The Fairmont Copley Plaza. With 12 confirmed brands and more to come, guests can experience what’s being made right around the corner from their own backyards. Blender Bender: The grand finale to this year’s Thirst Boston, the 2nd annual 1980s tiki party will take place at Chau Chow City in Chinatown on Sunday, November 9th. Twelve of the city’s top bartenders will battle it out for best blended beverage as voted on by guests. Bartender Brunch: Join friends and industry professionals for one last hurrah. On Monday, November 10th, The Hawthorne will host a sendoff brunch for Thirst Boston’s participants and attendees alike. This year, The Fairmont Copley Plaza will host a majority of Thirst Boston events and offer accommodations at a special attendee rate. Additional information on seminars, special guests & appearances, and more will be available in the next month. For more information about Thirst Boston, please visit http://www.thirstboston.com/, follow @ThirstBoston on Twitter, and become a Facebook fan https://www.facebook.com/ThirstBoston. 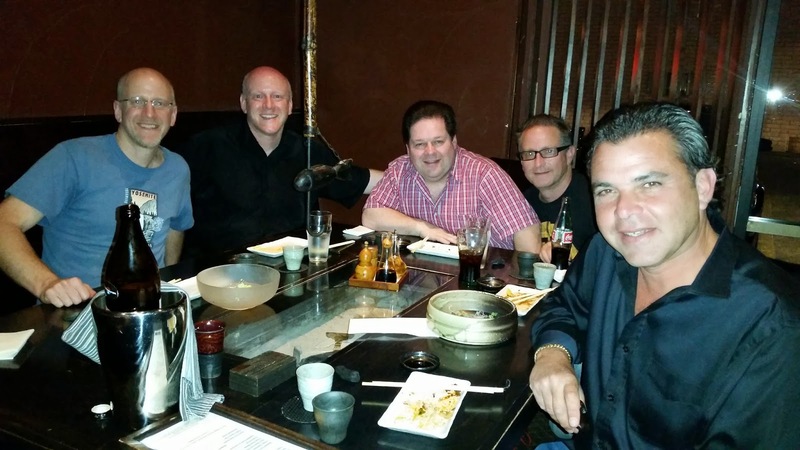 Five years ago, while in Las Vegas, I had an excellent dinner at Abriya Raku, a Japanese restaurant which then seemed to be a hidden treasure. Located in a small, Asian shopping center off the Strip, it was highly unlikely you would just stumble upon Raku. The area was filled with dozens of Asian restaurants, from Korean to Chinese, Thai to Japanese. You had to actively seek out Raku, but that meant someone had to tell you about it. You needed inside information, which I received from a few Las Vegas residents who raved about its cuisine. Based on those recommendations, I dined there and was thoroughly impressed. Times have changed and Raku is now getting plenty of publicity. For example, it is currently #1 on Eater's 38 Essential Las Vegas Restaurants. You no longer need special insider information to know about this restaurant. However, I worried a little whether the restaurant had changed since my prior visit, whether all that publicity might have had a negative effect on this former hidden treasure. Despite my worries, I knew I still had to dine there again, hoping to recapture some of my previous joy. On my trip to Vegas a couple weeks ago, I tried to make plans to dine at Raku and quickly noticed one change, that it was tougher to get a reservation there, even on a Tuesday evening. So if you want to dine there, I highly recommend making reservations as far ahead of time as possible. Fortunately, the five of us were able to get a table on a Thursday evening, and they sat us in a small private room that only had two tables. I certainly enjoyed the intimacy of this room and I'm pleased to report that our dinner at Raku was as good, if not better, than my prior visit. The quality of their food has not diminished in the least, and their Sake list has exapnded. All of my friends were impressed with the cuisine, especially considering its affordability. Service was excellent and I continue to give Raku my highest recommendation. Fame has not diminished Raku in the least. Raku's Sake menu appears to have grown, and now contains over 75 selections, from Junmai to Honjozo, Ginjo to Daiginjo, along with some Sparkling Sake and Nigori. Excellent diversity and plenty of interesting choices. Over 50 of the selections are available by the glass and some in "half" bottle formats. Price markups seem low, some of the best I've seen at any Japanese restaurant, and you could definitely while away an evening sampling and enjoying various Sakes. During the course of our dinner, we ordered three different bottles of Sake, none of which I had previously tasted. I wanted to experience something different, to continue expanding my Sake horizons. We began with the Nyukon "Into Your Soul" Tokubetsu Honjozo ($52/24 oz), which can retail for around $30 so the markup is less than twice the retail, making it a very good value. Produced by the Musashino Shuzo, which is located in the Niigata Prefecture, they use Gohyakumangoku rice for this Sake which has been polished down to 60%, so it would technically qualify as a Ginjo though they do not label it as such. The taste was dry and clean, with subtle peach and melon flavors, and hints of herbs. Smooth and easy drinking, this was delicious and would appeal to Sake lovers as well as those new to Sake. It went well with our initial dishes, from tofu to seafood. A great starting point for the evening. We then moved on to the Kamoizumi Shusen Junmai "Three Dots" ($50/30 oz), which can retail for $30-$35 so the markup is less than twice the retail, making it another good value. I should note as well that this bottle is 25% larger than the standard 24 oz bottle. So you get lots of Sake for the price. The Kamoizumi Shuzo, located in the Hiroshima Prefecture, started brewing Sake in 1910, and was one of ten breweries, in 1965, that committed to producing Junmai when nearly everyone else was making Honjozo. They use Hiroshima Hattan rice for this Sake which has been polished down to 58%, so it would technically qualify as a Ginjo though they do not label it as such. Another elegant Sake, this presents with a strong umami taste, more mushrooms and leafy herbs. It has a bit more body than the Nykon, but remains dry, smooth and easy drinking. This would be an excellent Sake with meat dishes. The final Sake was the Kokuryu Tokusen "Crystal Dragon" Ginjo ($58/24 oz), which can retail for $40-$43 so the markup is less than twice the retail, making it another good value. The name, Kokuryu translates as "Black Dragon" and the name derives from the Kuzu-ryo River ("Nine-headed Dragon" river) in the Fukui Prefecture. They use Gohyakumangoku rice for this Sake which has been polished down to 50%, so it would technically qualify as a Daiginjo though they do not label it as such. This was a more powerful Sake, with bolder flavors of fruit, especially melon, pear and even a bit of cherry. There were depths to the Sake as well, showcasing hints of other, nearly elusive flavors. Definitely a Sake to slowly savor, to enjoy its complexity. It also paired very well with the various Robata skewers we enjoyed. As for our food choices, we ordered a number of their evening Specials as well as numerous dishes off the menu. As the evening was primarily about enjoyment, I didn't take notes of everything we ate, though I took numerous photos. As such, I can't provide lots of detail of many things we ate, though I can say that everything was delicious, well-presented and I would recommend all of it. This is some of the best Japanese food you will enjoy in Vegas. Above, is one of their homemade Tofu dishes, accompanied by a spicy side. I'm not a fan of Tofu but I actually enjoyed this dish. The tofu was creamy and clean rather than rubbery, and the spicy side went well atop a piece of the tasty tofu. So even if you dislike tofu, I'd suggest you give it a try at Raku. They have a few different Tofu dishes and they are worth exploring. One of the Specials was a Tuna Tartare, a silky mound of tender tuna, with only minimal accompaniments, making the dish all about the tuna. I prefer my tartare to be more minimalist, to be more about the meat than what is atop it, and this fit that bill. A Salad which had bacon, so that automatically elevates it above other salads. Lots of fresh ingredients. There were two fish on the Specials menu, Flying Fish and Sea Bream, and each was served two ways, as a sashimi and a cooked, whole fish. Above is the Flying Fish sashimi, which had a stronger, but pleasing, flavor than the Sea Bream. The texture of the fish was tender and smooth, with just enough bite to it. The Sea Bream sashimi possessed a milder taste, with a buttery feel. Very tasty. The cooked Flying Fish had hearty chunks of meat, strong and tasty flavors with a nice broth. The Sea Bream's flesh was mild and flaky, with a nice sweetness to the flesh. And the skin had a nice, crispy texture. The Juicy Deep Fried Chicken also had a great, crispy skin, wrapped around moist and flavorful meat. One of their specialties is Robata, a charcoal grill that uses binchotan, a traditional Japanese charcoal which burns at a higher temperature than regular charcoal, and also contains less moisture. There are over 30 Robata choices, a variety of skewers of meat, seafood and vegetables. We ordered maybe a dozen or so skewers, including Pork Ear, Duck with Balsamic Soy Sauce, Tomatoes Wrapped in Bacon, and more. It was all excellent, grilled perfectly, and full of interesting flavors. You could easily make a meal of just different skewers. Raku is one of the best Japanese restaurants in Las Vegas, and also one of the most affordable. If you check out their menu, you will find most items cost under $10, so that even if you go with a group, your bill will still be very reasonable. In addition, their Sake is very reasonably priced, avoiding the outrageous markups that are very too common everywhere else. On the Strip, the Japanese restaurants are generally much more expensive, and it can be hard to find more than a couple items on their menus under $10. With an excellent Sake list, great service, and a nice diversity of delicious dishes, Raku continues to earn my highest recommendation. If you are traveling to Vegas, make sure to dine at Raku, but just make your reservations as early as possible. Raku is hidden no more, but success hasn't gone to their heads.